A similar stunt occurred last November, according to Ingrid Baeck, a chief spokeswoman for the Belgian Ministry of Defense, who sought to minimize the danger. But Baeck challenged the activists’ claims they went undetected for well over an hour, that guards were unarmed and that they were able to approach a hardened bunker containing sensitive materiel undeterred. “It was an empty bunker, a shelter,” Baeck said of the building. Way to paint a target on the loaded ones, genius. Just take your lumps, because you can’t pretend Belgian security didn’t fail. The activist incursion is an alarming anecdotal demonstration of a systemic security problem that was well documented before the February incident. In some important ways, Baeck is exaggerating herself — for example, we can see that the guard’s weapon is not loaded — but the real problem is that she also revealed where the activists ought to have gone. Nice way to get some kid shot on April 3, when they come back. 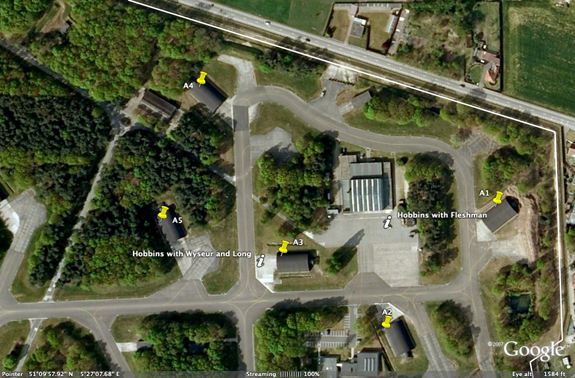 Yes, there are two sets of 11 shelters at Kleine Brogel, only one of which has WS3 vaults (Here is a set of Google Earth placemarks). The activists assumed that the one they accessed was the nuclear one based on their previous analysis (and the serendipity of an open gate). If you look at the pictures of the General Tom Hobbins visiting the 701 MUNSS at Kleine Brogel in March 2006, there are two wide-angle pictures that confirm the location of the WS3 as the area I have place-marked as A. The activists were in B.
Lt. Erline Wyseur (left) and Capt. Jason Long, 701 MUNSS, meet Gen. Tom Hobbins, U.S. Air Forces in Europe commander, during his unit visit March 10. If you open up the Google Placemarks, I am pretty sure they are standing in front of the shelter marked A3, with A4 in the background. You can see the hardened aircraft shelter, aligned at a 45 angle to the taxiway, over Hobbins’s right shoulder. A tree line runs along the left side of the taxiway and wraps behind the shelter, before breaking to a clear view of the horizon. Over Long’s left shoulder, there is a small clump of trees. In the high resolution image, you can also see what looks like a ditch. The obstruction visible over Hobbin’s right shoulder appears to be related to the ditch. 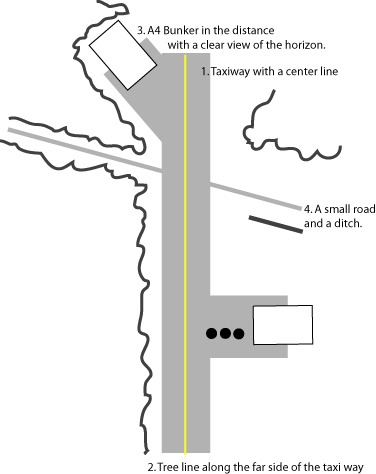 On the far side of the ditch, there is a small road that crosses the taxiway and it is visible over Hobbin’s right shoulder. There is no other bunker arrangement that even looks close. Moreover, here is another shot of Hobbins at a facility about 100 meters to the north. Chief Master Sgt. 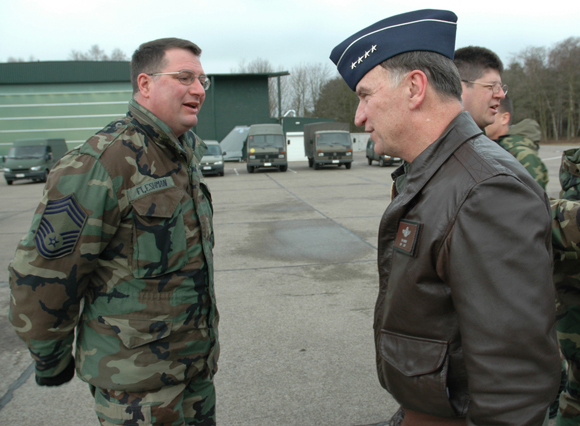 James Fleshman, 701 MUNSS, meets Gen. Tom Hobbins, U.S. Air Forces in Europe commander, during his unit visit March 10. Again — this doesn’t change the fact that Belgian security turned in a woeful performance. (I am still scratching my head over the lack of guard dogs.) This was an anecdotal demonstration of something that is, as I noted before, well-documented by US officials. Moreover, it’s quite a stretch for Baeck to say that the activists “never, ever got anywhere near a sensitive area” — they were inside the wire, which is a plausible definition of “near,” and the two areas are less than two clicks from one another. I continue to think that if the Belgian government (and other NATO governments) refuse to provide adequate security at Kleine Brogel, the weapons should be placed at US base where we will. And a note to our Belgian friends. I was going to keep these to myself, but since Ms. Baeck decided to help out, there isn’t much point. But please don’t try to get into area A. 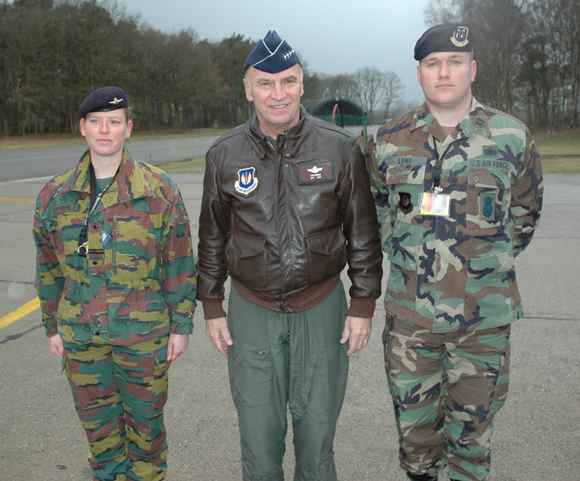 If the Belgian security is inadequate, the SACEUR has almost certainly assigned additional US security personnel. They will most likely respond very differently than the Belgian sort you are used to. Whilst agreeing with the general consensus that Belgian security appears woeful, what is it with Americans that they have to “big up” their own security / operators? The last two sentences read close to ‘my dad is bigger than your dad’ etc. and do not make a cogent argument. whilst fully aware of US self-importance, how likely is it that american operatives on foreign soil would necessarily be any more alert / responsible to security penetrations? it is more the sense of being at peace ( as opposed to the ‘war years’ of the cold war) that is to blame. furthermore, what is the legal status of any US operatives on foreign bases – do they have sovereign rights etc. or are they subject to local laws? don’t get me wrong, i think it very disturbing these security breaches have occurred, i just doubt that US forces would be any better at dealing with them. i fear there is a fundamental lack of responsibility regarding these weapons perhaps still seen as a cold war throwback. I take your point that I should not imply that the US would necessarily provide better security. I hope that it would, though recent Air Force problems are sufficient reason to doubt. As for the sentence about the reaction of US forces, I just mean that our security culture is different and I don’t want anyone to get shot. It should perhaps also be noted that American security forces have not had the “sense of being at peace” for the past nine years or so, on account of a pesky ongoing war or two. Whether that is a reasonable mindset is pretty much irrelevant, as is the question of their legal status – US security personnel are likely to have real bullets in their guns, and to use them if they believe there is a threat. Please don’t provoke them. If you go by the school that a security force should be matched to the load, the solider with an unloaded rifle is apropos. These people obviously were not armed, nor did they have any real mal intent. I think an unarmed soldier is a very civilized response to the incursion. I’m not saying there should not be a set of snipers out of view. But let’s face it if these people were doing this against an American security force they’d have been beaten, arrested, interrogated, their video would have been wiped of its contents, and they’d be facing several years in federal prison. In the end all they did was provide a public warning by a friendly foe. At many levels I find myself impressed with the public face of Belgian security. Don’t get me wrong this civilized response should have happened at the perimeter fence, not at the bunker itself. As for the assurance that the bunkers that were visited were empty, well that can be taken so many ways that you really can’t extract real information from that. What we do know is you could get past the fence, hang out on an active runway, and tag some shelters. I wonder if any plane spotters have gotten any great shots on airliners.net given the relaxed access to the active runway. Has the practice of keeping nuclear weapons throughout NATO become more of a liability than nuclear advantage? How necessary are some of these deployment sites in an actual nuclear contingency? I think it’s time to move some weapons. I’m curious as to why they are stored in the general shelter area at all. Wouldn’t it make much more sense to have them in the QRA area in the north?